2 out of 5 people around the world believe that the traditional employment structure will not be around in the future. The sharing with Airbnb and Uber is clearly expanding in the workplace. How? Short term assignments, working for a few geographically dispersed companies simultaneously and taking time off regularly will be soon the key elements of working culture. The younger educated and technologically savvy generation does not see the advantage of staying with one employer for too long. It is just natural that they crave freedom in their lives and in the workplace. A study by PWC shows that what 29% of the people around the globe want more from a job is the chance to take control over their career, what they do and when they do it. Add the fact that the instability in the workplace has been a tendency for a long time and that companies are constantly changing in order to adapt to the fast moving markets. What will a day in the life of a contractor in 2022 be like? 7am Online meeting with prospective client in Shanghai who needs your expertise during the next 10 months. Don’t forget, always be selling! You are your own sales person and your own company, your future is entirely in your hands. Personal branding is crucial and your biggest asset. 7:30am 5 minute daily stand up with Janelle, your Virtual Assistant in the Philippines. 7:35am Time to get some work done! You are focusing only on your project and on the task you have been assigned to. The old style like procedures, paperwork and politics seem so distant. Great to be away. Interactions with colleagues around the globe are done via videoconference and other collaboration tools. Email is so 20th century. 12pm Go for a run. Since you and your family moved to Bali, you are all so much healthier and your concentration and focus is skyrocketing This also thanks to the VA Janelle, who took over all the non-core tasks for a fraction of the money you would pay back home! 1pm Fly to Kuala Lumpur for an end of the project meeting in the client’s office. It is the second time you meet face to face after the kick-off meeting when you established rapport and relationship which turned to be a good investment. 6pm You get confirmation that the job in Shanghai will start in 3 weeks. Until then… relax and visit friends in Europe. Of course with your trilingual kids (English, Polish, Indonesian and some Balinese they picked up from the local kids) who follow blended learning – partially remote and partially F2F. True TCK’s. Companies increasingly adopt “Change” as the Leitmotiv. They already work in a matrix organization where team members come in and out of projects as they are needed and bringing their expertise. There will be no longer a stable team that works on one project after the other without clear reporting lines – dotted lines are normal. We will be working with globally dispersed and culturally diverse workforces which will outperform the homogeneous companies. Check here how to avoid over-homogenization of your teams. As we discussed in previous articles, managers will need to make a change in the way they are treating their teams today and acquire new skills so they can be productive in the new scenario. 46% of HR professionals expect that by 2022 at least 20% of their workforce will be temporary workers working on short term projects. 31% of HR managers are already adjusting their talent strategies. Creating virtual closeness and keeping motivation might be some of the biggest challenges. 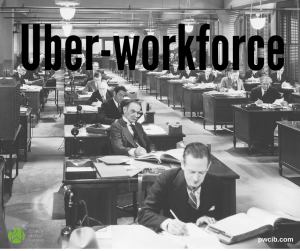 If you are not ready for the scenario, let us help preparing your leaders to attract and retain uberised workforce and outperform others. Next Next post: Japan – Is running meetings difficult?